Hon'ble Chief Minister of Tamilnadu Thiru.Edappadi K Palaniswami has made an historic announcement in Legilative Assembly on 01-06-2018 that the maximum age limit to appear in TNPSC Group 1, 1-A, 1-B Posts Examination is increased for SC/ST/MBC/BC/DNC from 35 years to 37 years. For General catagories, the maximum age limit has been increased from 30 years to 32 years. The Certificate Verification is scheduled to be conducted from 05.06.2017 to 09.06.2017 at TNPSC Office, Chennai. What is the expected cutoff marks ? Expected Cut off details will be updated soon in this page. TNPSC Group 1 Preliminary Exam was conducted on 19th February 2017. The examination was attended by nearly 2 lakh people through out Tamilnadu. TNPSC Group 1 official answer keys are expected to be published with in two to three days. If you are eager to check your answers, you may test your answers with anyone of the following unofficial answer keys by Private Coaching Centres. Tamilnadu Public Service Commission has published the Admit Card (Hall Ticket) for TNPSC Group 1 Preliminary Exam 2017. Candidates can download the Hall Ticket from TNPSC's Official Website www.tnpscexams.net using Application Number / Login ID and Date of Birth. If you have not downloaded the Hall Ticket, download it soon . All the best ! TNPSC Group 1 2017 applicants can now check their application status from TNPSC Official Website http://tnpscexams.net/ . The Hall Ticket for the Group 1 2017 will be published one or two weeks before the Exam date only. So we can expect the TNPSC Group One Exam Hall Ticket with in the second week of February 2017. Last date for submission of online application for TNPSC Group 1 Exam 2016 is extended to 12th December 2016. Last date for payment of fee in offline mode will be 15th December 2016. However, there will be no change in the date of Preliminary Examination. 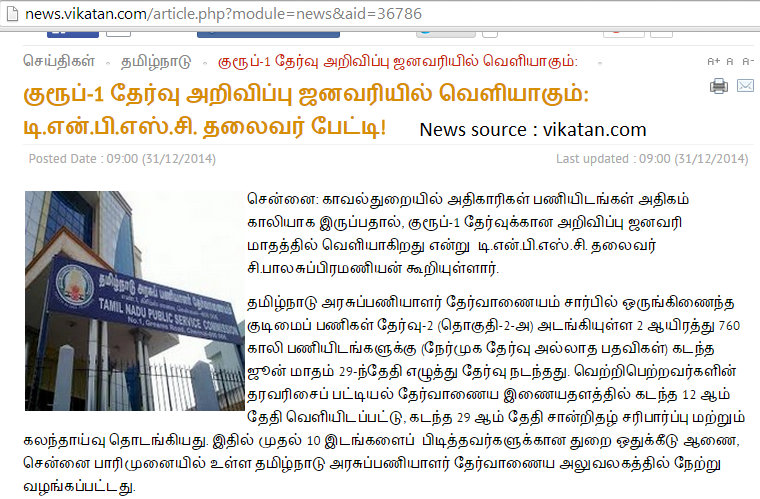 TNPSC Secretary M. Vijayakumar, I.A.S., has informed this. How to apply for TNPSC Group 1 Exam 2016 ? Group 1 Exam applications can be made through online mode only through www.tnpscexams.net website. Can a Final Year Student Apply for TNPSC Group 1 Exam 2016 ? Yes , according to TNPSC Group 1 Notification 2016 , the students, who have written the final year UG Degree Examination may also apply for the TNPSC Group One Preliminary Examination 2016. But they should produce proof of having passed the degree examination when they are admitted to write TNPSC Group 1 Main Examination. Candidates who have passed the final year MBBS or any other Medical Degree Course Examination but have not completed the internship also can apply for the TNPSC Group 1 Preliminary Exam. But, when they are admitted into the main written exam, they should submit a copy of certificate of passing the final examination in their degree. The Group One Examination Selection is done in three consecutive stages. First Stage : Preliminary Examination - It is merely a screening test only. The marks scored in the Group 1 preliminary examination will not be counted for final selection list. Candidates will be allowed to write the main examination in the 1: 50 ratio ( 50 times of the total number of vacancies). Chest - Not lest than 86 cms round the chest on full inspiration. Must have chest expansion of not less than 5 cms on full inspiration. Three Papers in Generala Studies - Descriptive Types Degree Standard. Candidates claiming fee exemption also have to pay the application cost. 02-11-2016 : Happy News for TNPSC Group 1 Aspirants ! 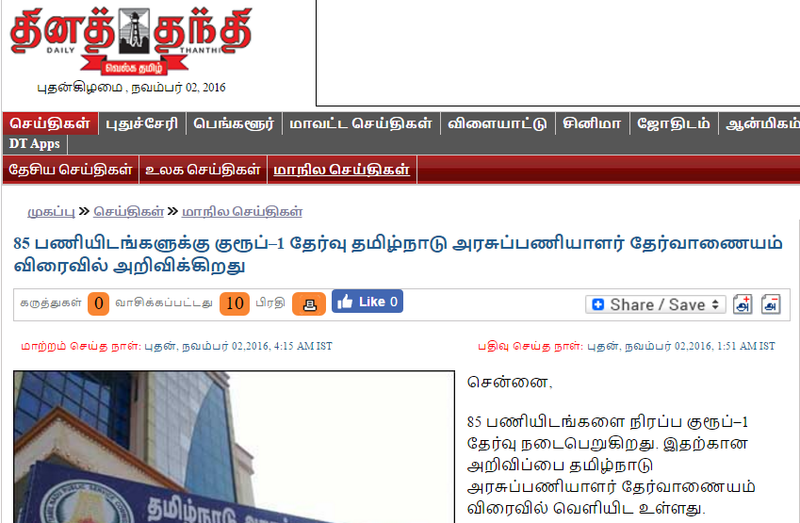 TNPSC Group 1 Exam 2016 Notification Expected to be published on 9th November 2016 - Dinathanthi News. Total Number of Vacancies will be 85. According to the news, there are 30 Deputy Collectors, 33 DSPs and 22 Assistant Commissioner, Commercial Tax and Rural Development Posts in the upcoming notification. The Group 1 Preliminary Exam is expected to be held in February 2017. The official Notification for TNPSC Group 1 Exam 2016 from Tamilnadu Public Service Commission is expected on 9th November 2016. What TNPSC Annual Planner Says about Group I 2016 Notification ? According to TNPSC Annual Planner 2016 - 2017, The Group 1 2016 Exam (Combined Civil Service Examination - I) Notification was scheduled to be published in the first week of August 2016 and the Examination was scheduled to be conducted on 27-11-2016. The result of the Group I Exam 2016 also scheduled to be published on 4th week of March 2017. So we can expect the notification for TNPSC Group 1 Exam 2016 to be published soon by the Tamil Nadu Public Service Commission. 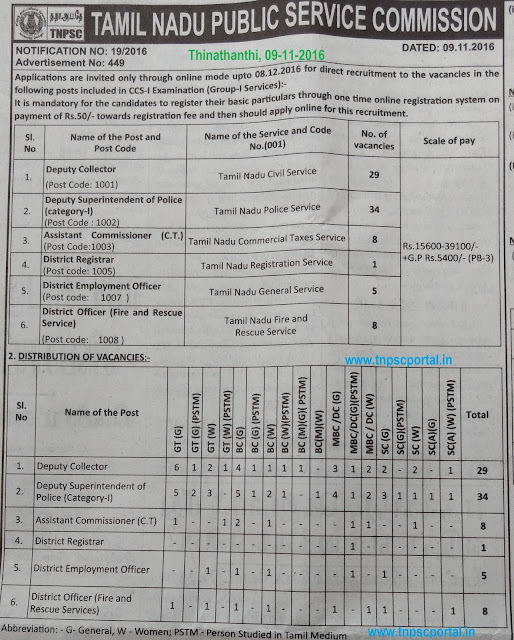 In the TNPSC Annual Planner, it is given that the total number of Group 1 Posts vacancies is tentatively mentioned as 45, but this year the vacancies expected to be higher than this. So, start your sincere preparation for both prelims and mains from today itself. All the best ! 29-07-2016 : TNPSC Group 1 Exam 2016 Notification coming after Group IV 2016 notification 2016 - TNPSC Chairman informed today at a press meeting . Dear Group 1 Exam aspirants, start your sincere preparation for the Preliminary Examination from now itself. All the best ! 19-08-2016 : TNPSC Group I Final Rank List Published at TNPSC Website http://www.tnpsc.gov.in/results.html. 12-08-2016 : TNPSC Group 1 Mains Exam 2015 Marks Written and Interview Marks Published at http://www.tnpsc.gov.in/results.html. 17-06-2016 : TNPSC Group 1 Mains Exam 2015 Result Published. The result of TNPSC Group 1 Mains Exam conducted on 05.06.2015, 06.06.2015, 07.06.2015 is published at TNPSC Official Website www.tnpsc.gov.in/results.html . The Certificate Verification for the listed candidates in the website will be conducted on 04.07.2016 & 05.07.2016 at TNPSC Office, Chennai. 11-11-2015 : TNPSC Group 1 2015 Official Answerkey ( Tentative) is published at the TNPSC Official Website http://www.tnpsc.gov.in/answerkeys.html. You may see the TNPSC Group 1 Expected Cut Off Prediction of www.tnpscportal.in here. 8-11-2015 : Dear friends, hope, you all have done this year TNPSC Gr I Prelims 2015 Exam well. Now you may download the TNPSC Group One Prelims 2015 Answerkeys of Coaching Centres like Appolo Study Centre, Chennai and NR IAS Academy, Trichy (Click here). To see the TNPSC Group 1 Exam 2015 Expected cutoff marks prediction by www.tnpscportal.in Click Here. Download TNPSC Group 1 Hall Ticket for the 8th November 2015 Exam from TNPSC Website www.tnpscexams.net . TNPSC Group I Prelims Exam 2015 is scheduled to be conducted on 8th November 2015. You can download your admit card now from the following TNPSC Official Websites links. TNPSC Group 1 Exam 2015 Answer Key and Expected Cut off marks will be updated in our website at 4pm today. The official answerkey for TNPSC Group 1 2015 will be published with in this week. If your application for the Group 1 2015 is not available, dont worry, please contact TNPSC office through following email contacttnpsc@gmail.com before 13th October 2015 with sufficient documents like receipt of fee payment copy etc. This is not Hall Ticket, the Hall Ticket is usully published just one week before the exam. TNPSC published Group 1 2015 Exam notification on 10-07-2015. TNPSC Group 2A Non Interview Posts Exam 2015 Notification is Published. Apply online now. 07-09-2015 : Total applicants for the TNPSC Group 1 2015. Total 2,41,791 candidates have applied for the TNPSC Group 1 Preliminary Examination this year. News source : The Hindu Tamil, 7-9-15. 21-08-2015 : TNPSC Group 1 Exam 2015 Free Coaching by Tamilnadu Government SC/ST Officers Associations. The Coaching Classes starts from 21-08-2015. Interested candidates can contact 9486592823 for registering your name. 11-08-2015 : According to TNPSC Chairman's recent interview there are 222771 candidates have applied for the TNPSC Group One 2015. Most of the candidates are from engineering stream. 08-08-2015 : Tomorrow ( 09-08-2015 ) is the last date to apply online for the Group One Exam. As on 07-08-2015, 1,61000 aspirants have applied for the TNPSC Group 1 Exam - TNPSC Chairman informed. 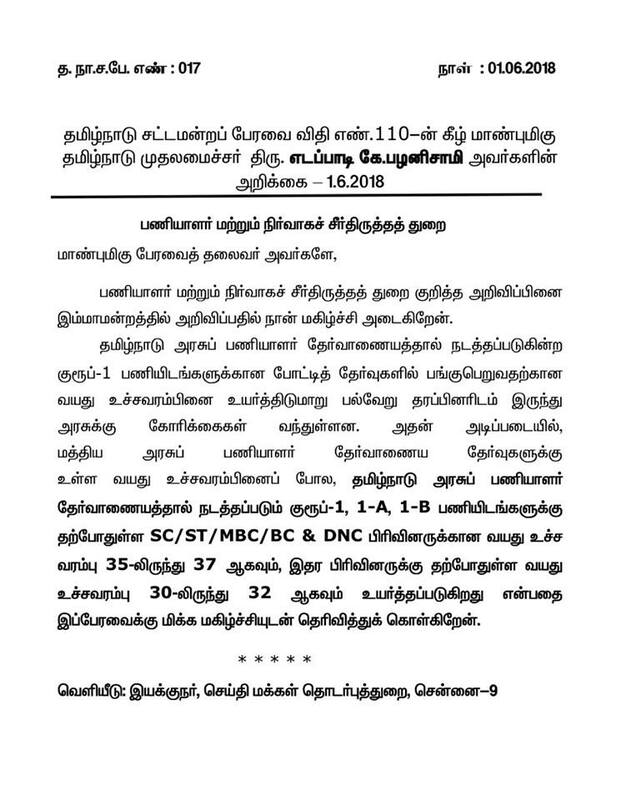 The newspaper says the Official Notification of the TNPSC Group One 2015 Announcement will be published on tomorrow (10-07-2015, Friday) . The total number of vacancies will be 74. This is to be noted that this year, the number of vacancies for both Deputy Collectors and DSPs Posts are high. So bright future is there if you work hard. All the best ! 07-07-2015 : TNPSC Group 1 2015 Exam Notification to be published in two days. The exam date may be in October 2015. Total expected vacancies 70 . 16-06-2015 : TNPSC Group 1 Notification with in Ten days - TNPSC Chairman informed during an interview to the media persons today that the TNPSC Group 1 Exam 2015 announcement to be published with in 10 days. 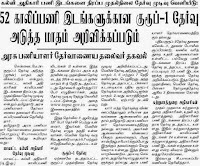 News Source : Dinakaran, 16-06-2015. 13-06-2015: TNPSC Group 1 Notification will be published soon . During a press meet on 12-06-2015, the TNPSC Chairman informed about the TNPSC Group One Announcement will be published soon. Source : Dinathanthi, 13-06-2015. 06-06-2015: TNPSC Chairman has already informed that the Group 1 2015 Exam Notification by Tamil Nadu Public Service Commission will be published before 15-06-2015. Expected number of total Vacancies in upcoming TNPSC Group 1 2015 Exam will be around 74 . 06-06-2015 : TNPSC Group 1 Mains Exam 2015 Result will be published with in two months - TNPSC Chairman. News source : The Hindu Tamil, 06-06-2015. Aspirants, start your Group One Preliminary Exam Preparation from today itself. All the best ! 14-05-2015 : TNPSC Group 1 2015 Notification to be published in the second week of June 2015 TNPSC Chairman Informed. He also informed the Total Vacancies in TNPSC Group One 2015 will be around 74 in the upcoming TNPSC Group 1 Notification 2015. Dear all TNPSC Group 1 Aspirants, start your sincere preparation for the preliminary exam from today itself. TNPSCPortal wishes you great success to you all ! 30-04-2015 : TNPSC Group 2 Interview Posts Exam 2015 Notification Published - Check Soon. 23-04-2015 : TNPSC Group 1 Mains Exam 2015 has been postponed to June 2015 . Earlier the TNPSC Group 1 Mains Examination was scheduled to be conducted on 2,3,4 days in the month of May 2015 . Now the examinations are postponed to 5,6,7 of June 2015. About 4389 candidates compete for 79 Group 1 Posts this year. 07-04-2015 : TNPSC Group 1 2015 Notification will be published in the last week of April 2015 - TNPSC Chairman informed. He also clued that the total number of vacancies in the upcoming TNPSC Group 1Exam notification will be around 60 . There will be 13 Deputy Collector and 25 DSP posts among the total number of vacancy. The TNPSC Chairman also informed that the TNPSC Group 2 Exam 2015 Notification and TNPSC Group 4 Result of December 2014 Exam also will be published in the last week of this month. 14-03-2015 : TNPSC Group 1 Exam 2015 Notification to be published in the first week of April 2015 - TNPSC Chairman Informed. 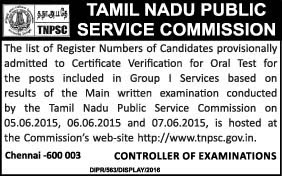 Total number of vacancies in the TNPSC Group 1 exam notification for this year (2015) is expected around 47 . This year in 2015, the TNPSC Group 1 2015 vacancies will include Deputy Collector, DSP, Assistant Commissioners in Commercial Tax, etc., So start your TNPSC Group 1 Preliminary Exam 2015 preparation from this moment itself. All the best ! 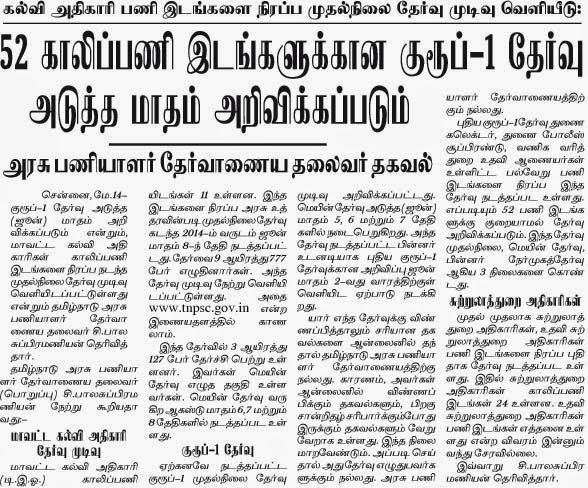 News Source and Courtesy : Dinathanthi Newspaper, 03-14-2015. 07-02-2015 : According to the TNPSC Annual Planner 2015-16 published on 30-01-2015, TNPSC Group 1 Notification 2015 Announcement is expected to be published in the first week of April 2015 and the tentative date for TNPSC Group 1 preliminary examination is scheduled to be held on 05.07.2015. Many private coaching centres through out Tamilnadu have started coaching classes for the Group 1 Preliminary Examination 2015 . If you are sincere and preparing yourself , don't wait for the notification date, start your TNPSC Group 1 preliminary exam 2015 preparation from today itself. 28-01-2015 : TNPSC Group 1 2015 Notification is expected to be published very soon. Total number of expected vacancies in the upcoming TNPSC Group 1 Exam notification in this year may be around 50 . 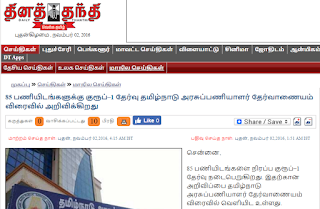 (source: maalaimalar news, 28-1-2015) Group 1 Preliminary Exam 2014 Result to be published soon - TNPSC Chairman Informed today. 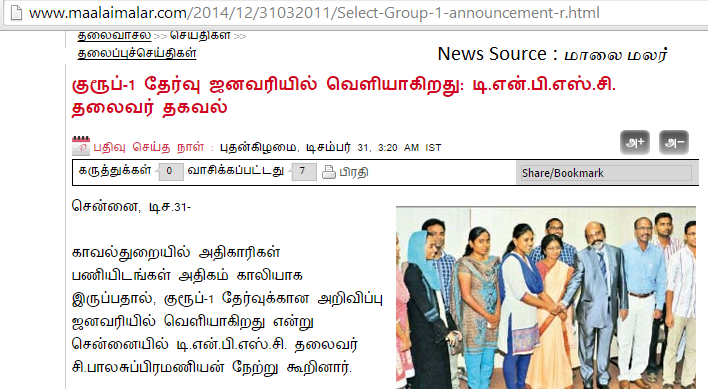 30-12-2014 : TNPSC Group 1 2014 Result to be published soon - TNPSC Chairman Informed. The TNPSC Chairman has informed that the next TNPSC Group 1 Exam 2015 Notification will be published with in the month of January 2015 . While issuing appointment order to the top 10 rank holders in TNPSC Group 2A ( Non Interview Posts) Exam 2014, the chairman informed the media persons. 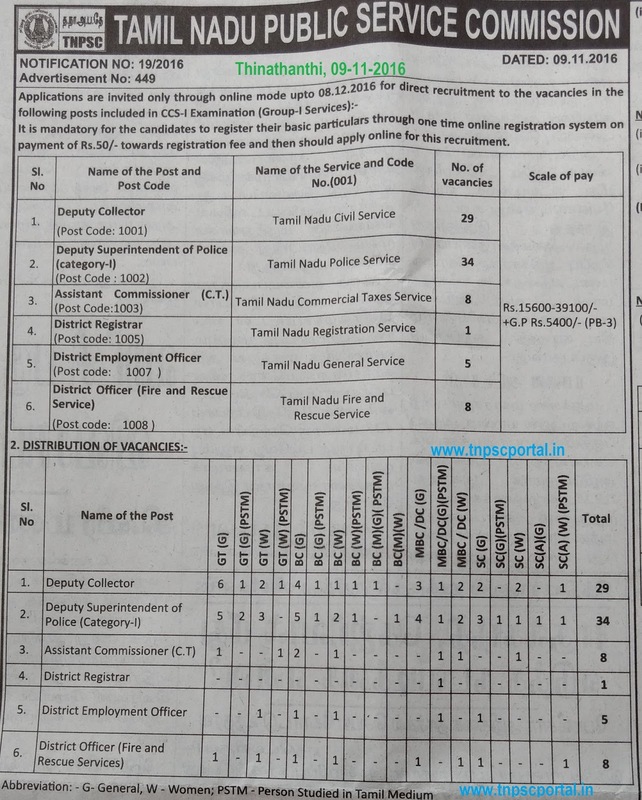 According to Maalaimalar and Vikatan news, this year the TNPSC Group 1 Exam 2015 is to be called for earlier due to the increased number of vacancies in Police Department (DSP Posts). Dear TNPSC Group 1 Aspirants, a great opportunity is awaiting for you in this NEW YEAR 2015. If you have not done the earlier TNPSC Group 1 Exam 2014 well, start your preparation for the upcoming TNPSC Group 1 2015 Exam from today itself. All the best ! Take this as a challenge and set a goal to become a Group 1 officer in the upcoming Group 1 Exam . May GOD Bless You All !